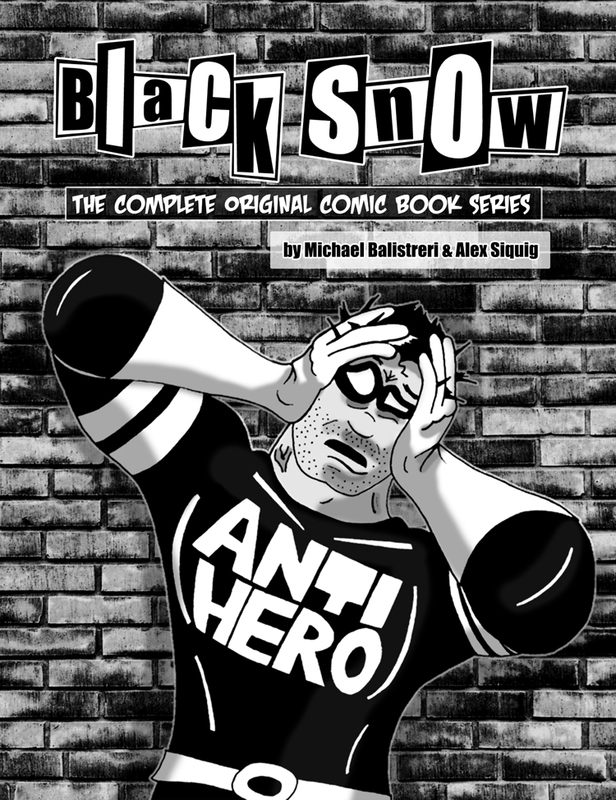 We’ve just released our first book to be available for sale online, Black Snow: The Complete Original Comic Book Series. You can order it from our online store or on Amazon. We make more money if you buy it from us. So what’s in the book. All six of the original comic books, brought together for the first time. It also contains a forward and epilogue from me. And a super snazzy cover! It’s 198 pages for only $17.99. I digitally enhanced the resolution and contrast of every page from issues 1-5 (6 didn’t need it), cleaned up some of the dialogue, redid the credits for issue 1, and several other small things to improve the overall quality. So what you get is the complete original saga, as it’s never been seen before. All the goofiness, the ridiculous characters, the drama, the romance, the intrigue, the movie and comic book references…it’s all there. So if you love Anti-Nazis, evil clowns, pompous super heroes, apes, cannibal car salesmen, elemental powered villains, voodoo, smoking, Detroit, Fargo, drinking, lazy super heroes, Mystery Men, old fashioned bartenders, Native Americans, fishermen, cops, humans with dog heads, brutal fights, corrupt doctors, mysterious villains, annoying sidekicks and anti-heroes…well, this might just be the book you’ve been waiting for. So take a chance and order an underground masterpiece that is sure to leave you with a smile. One Response to "Black Snow: The Complete Original Comic Book Series"
Congratulations on your first print publication! Anyone with a sense of fun should get over there and buy this book, right now!